Only 6-miles from Reunion Resort, there is something for kids of all ages at their four theme parks. Explore 11 countries at Epcot, adventures for the animal lovers at Disney’s Animal Kingdom, experience the glitz and glamour of Hollywood at Disney’s Hollywood Studios and dreams come to life at the Magic Kingdom. Three amazing Orlando theme parks packed with epic thrills and adventures. Known for bringing you into the excitement of movies and TV, experience daring water adventures and moments of peaceful relaxation at the new water theme park Universal’s Volcano Bay. Built from the bricks up, this interactive family theme park is designed specifically for families with children ages 2 to 12 years old. Explore 10 theme zones: Miniland USA, Imagination Zone, LEGO City, LEGO Kingdoms and more. Immerse yourself in wonder, where the aquatic world comes alive. Enjoy everything from riding the mighty Manta, share an epic voyage with sea turtles, see the world through the eyes of a penguin, laugh with Clyde and Seamore’s Sea Lion High show, plus so much more! Experience all the family beach fun to be had along 23 miles of Atlantic coastline. Indulge in Daytona Beach’s famed arts scene, festivals and attractions, local eateries, shopping and golf then venture out on day trips to explore Kennedy Space Center, Orlando and St. Augustine. Discover a shopper’s paradise like no other destination in Orlando. Designer brands and the hottest fashion trends are always in style at The Mall at Millenia and The Florida Mall where shoppers will find top department stores. Orlando’s outlet centers, including Orlando Premium Outlets – International Drive, Orlando Premium Outlets – Vineland Avenue, and the Lake Buena Vista Outlets, feature a wide selection from the world’s top designers at incredible savings. It’s been called the quintessential beach town, and Cocoa Beach, an hour’s drive east of Orlando on Florida’s beautiful Space Coast, offers endless ways to enjoy recreation and leisure. If you are planning a day at the beach, you’ll find everything you need in Cocoa Beach and the Space Coast area to make your stay one to remember. Downtown Orlando is a premiere destination featuring a wide array of amenities, including the best in sports and entertainment. With many options to choose from including cultural events, museums, a multitude of nightlife options, and walking around our Main Streets, Downtown Orlando offers something for residents and visitors alike. No matter what type of experience you are seeking, Downtown Orlando offers options for all to enjoy. Clearwater offers a seemingly endless supply of entertainment, natural beauty, and outdoor activities both on land and at sea. Enjoy casual and fine dining, vibrant activities and the rich history and heritage of the area in a mild, temperate climate. Caressed by tranquil Gulf breezes, its beaches offer miles of sugar-white sand, crystal clear waters and are consistently ranked among America’s most beautiful! 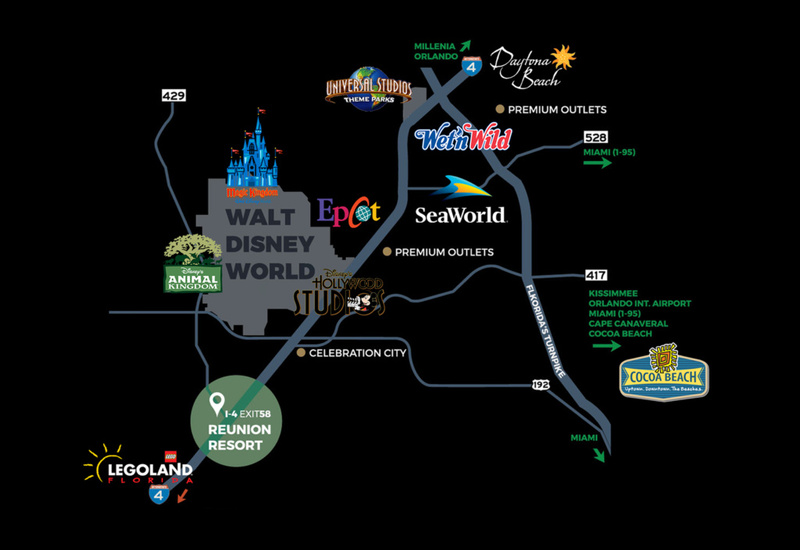 Reunion Resort & Club is a premium 930 acres resort located 2 miles away from Disney World. It was built around 3 golf courses designed by Jack Nicklaus, Tom Watson and Arnold Palmer. It features a 5 stars Hotel, Convention center, 6 Restaurants, 11 Swimming Pools, 6 Tennis Courts and a Spa.